Kenosha Factory, Kenosha, Wisconsin, U.S. Most Ambassador models were built in Kenosha, Wisconsin. They were also built at AMC's Brampton Assembly in Brampton, Ontario from 1963 to 1966. Australian Motor Industries (AMI) assembled Ambassadors from knock-down kits with right-hand drive from 1961 to 1963. The U.S. fifth generation Ambassadors were produced by Industrias Kaiser Argentina (IKA) in Córdoba, Argentina from 1965 to 1972, as well as assembled by ECASA in Costa Rica from 1965 to 1970. Planta REO assembled first-generation Ambassadors in Mexico at its Monterrey, Nuevo León plant. Fifth and seventh generation Ambassadors were modified into custom stretch limousines in Argentina and the U.S.
American Motors planned to produce a stretched a 117-inch (2,972 mm) wheelbase version of the Rambler platform for Nash dealers to be the new Nash Ambassador, and another for Hudson dealers. Shortly before committing to production of the new long-wheelbase versions of the Hudson and the Nash, CEO Romney decided to abandon the Nash and Hudson marques. Despite the fact that the Nash and Hudson names were canceled, work on the car itself continued, and American Motors introduced debuted in the fall of 1957, the 1958 "Ambassador V-8 by Rambler" on a 117-inch (2,972 mm) wheelbase. Its features included a 327 cu in (5.4 L) V8 (equipped with a 4-barrel carburetor and dual exhausts and rated at 270 hp (201 kW; 274 PS) and 360 pound force-feet (490 N⋅m) of torque) mated to a BorgWarner supplied 3-speed automatic transmission with push button gear selection. In 1956, AMC first produced its own V8, a modern overhead valve V8 displacing 250 cu in (4.1 L), with a forged steel crank shaft, which when equipped with a 4-barrel carburetor was rated at 215 hp (160 kW; 218 PS). In 1957, AMC bored and stroked the 250 CID V8 to 327 cu in (5.4 L) displacement which when offered in the Rambler Rebel used solid lifters and Bendix electronic fuel injection was rated at 288 hp (215 kW; 292 PS). In 1958, the Ambassador was equipped with a hydraulic lifter version of AMC's 327 CID V8 rated at 270 hp (201 kW; 274 PS). Although AMC's 327 CID V8 shares its displacement with the Chevrolet small-block, AMC's 327 came out six years before Chevrolet first offered its 327 in 1962. The Ambassador was available in a body style exclusive to its line, a pillarless hardtop Cross Country station wagon. The 1958 Ambassador was offered in a single high level trim level and came equipped with such luxury items as electric clock, twin front and rear ashtrays, Nash tradition "deep coil" spring suspension front and rear, split back reclining front seats that fold down into a bed, as well as upscale fabrics for the interior. Management had found that the public associated the Rambler name with small economy cars, and did not want the upscale nature of the new Ambassador to be so closely associated with Rambler's favorable, but economical image. Therefore, a decision was made that the larger Ambassador would be marketed as the Ambassador V-8 by Rambler in order to identify it with the Rambler name's burgeoning success, but to indicate an air of exclusivity by showing it to be a different kind of vehicle. However, the car wore "Rambler Ambassador" badges on its front fenders. The 1958 Ambassador is a substantially longer car than the 108-inch (2,743 mm) wheelbase Rambler Six and Rebel V8, although both lines shared the same basic body, styling, and visual cues. However, all of the Ambassador's extra nine inches (230 mm) of wheelbase (and, therefore, overall length) were added ahead of the cowl, meaning that the passenger compartment had the same volume as the smaller Ramblers. The Ambassadors came with plusher interior and exterior trims while the front end incorporated the Rebel "V-Line" grille from the prototype Hudson model. Through effective market segmentation, the Ambassador was positioned to compete with the larger models offered by other automakers. Model identification was located on the car's front fenders and deck lid. Super trim level Ambassadors featured painted side trim in a color that complemented the body color; Custom models featured a silver anodized aluminum panel on sedans and vinyl woodgrain decals on station wagons. Ambassador body styles included a four-door sedan and a hardtop sedan, a four-door pillared station wagon, and the aforementioned hardtop station wagon, a body style that first saw duty as an industry first in the 1956 Nash and Hudson Rambler line, on which all of the 1958 Ramblers were based. The Ambassador had an excellent power-to-weight ratio for its time and provided spirited performance with 0 to 60 mph (0 to 97 km/h) times of less than 10-seconds, and low 17-second times through a quarter-mile (402 m) dragstrip. It could be equipped with a limited slip differential, as well as power brakes, power steering, power windows, and air conditioning. Numerous safety features (such as deep-dished steering wheels and padded dash boards) came standard, while lap seat belts were optional. For 1959, the Ambassador received a revised grille, side trim, and redesigned rear door skins that swept into the tailfins instead of terminating at the C-pillar. Scotchlite reflectors were also added to the rear of the tailfins to increase visibility at night. Front and rear bumpers were over 20% thicker, and featured recessed center sections to protect license plates. Adjustable headrests were now available as an option for the front seats, an industry first. AMC touted the added comfort the headrests provided, as well as their potential for reducing whiplash injuries in the event of a rear-end collision. Other changes included the activation of the starter through the neutral pushbutton (on automatic transmission equipped cars), and the addition of an optional "Powr-Saver" engine fan, which featured a fluid-filled clutch for quieter high-speed operation. The 1959 model year also saw the addition of an optional "Air-Coil Ride" air suspension system, utilizing air bags installed within the rear coil springs. An engine-driven compressor, reservoir, and ride-height control valve comprised the rest of the system, but as other automakers discovered, the troublesome nature of air-suspension outweighed its benefits. AMC discontinued the unpopular option at the end of the model year. Ambassador sales improved considerably over 1958, reaching an output of 23,769; nearly half of which were Custom four-door sedans. Much rarer was the hardtop station wagon, of which only 578 were built. 1960 saw the Ambassador lineup totally reskinned, wearing new fenders, hood, deck lid, door skins, roofline, grille, taillights, bumpers, windshield, and backlight. Significant were the lower hood line, lower windshield cowl, simplified side trim, egg crate grill, while the tailfins were reduced in height and were canted to either side making for a modern and integrated appearance. The overall effect was rather fresh, as the new roof had a lower, lighter look, to complement the lower fins and grille. All Ambassadors came equipped with the American Motors 327 cu in (5.4 L) V8, but for the first time it was available in two versions. First was the original 270 hp (201 kW; 274 PS), 360 lb⋅ft (490 N⋅m) of torque, performance version equipped with the 4-barrel carburetor and a 9.7:1 compression ratio, which required premium fuel, and a second economy version running on regular gasoline making 250 hp (186 kW), 340 lb⋅ft (460 N⋅m) of torque, equipped with a 2-barrel carburetor and an 8.7:1 compression ratio. Ambassadors now came with a unique compound curved windshield that cut into the roof. This improved visibility, did away with the “knee knocker” dogleg design of AMC's first generation wrap-around windshield, and resulted in an even stiffer unitized structure. The 1960 Ambassador had a low cowl which with the compound windshield afforded excellent visibility. The Ambassador was offered in higher end Custom or entry level Super trim levels. All 1960 Ambassadors came with a new instrument cluster under a padded cowl, as well as illuminated controls for lights, wipers, fan, and defrost functions. The 1960 Ambassadors continued with an enclosed drive shaft (torque tube) and coil springs at all four corners, although the suspension was revised resulting in better handling. 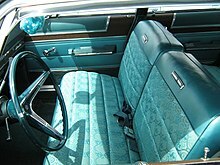 The top-of-the-line Ambassador models came standard with individual "airliner" reclining front seats that now had even more luxurious fabrics than in previous years. The Ambassador was the only American midsize, luxury high-performance car offered in 1960. The 1960 Ambassador came in 4-door sedan, 4-door pillarless hardtop, 4-door station wagon, and a 4-door pillarless (hardtop) station wagon. Equipped with the 270 horsepower 327 cu in V8, and the Borg Warner pushbutton-operated 3-speed planetary gear and torque converter automatic transmission, the Ambassadors reached 60 miles per hour (97 km/h) in just over 9 seconds and passed the quarter-mile in 17 seconds. The 1961 Ambassador continued the previous year's 117-inch (2,972 mm) basic unitized platform, but received an unusual new front-end styling that was overseen by AMC's in-house design department headed by Edmund Anderson. The new face consisted of a trapezoid grille and headlights that floated in a body-colored panel, while the front fenders arched downward and forward of the leading edge of the hood. Different from anything else on the market, AMC's marketing department promoted the look as "European." While the new look was meant to distinguish the Ambassador from the lower-priced Ramblers, it was neither a consumer success nor well received in the automotive press. Overall sales fell as the entire industry was experiencing a recession. The hardtop sedan and wagon models did not return for 1961. Standard was the 250 hp (186 kW; 253 PS) 327 cu in (5.4 L) V8 with a synchromesh manual transmission. Optional was the 270 hp (201 kW; 274 PS) "power pack" version with dual exhaust system featuring new ceramic-coated mufflers guaranteed for the life of the car. 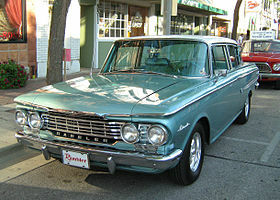 By the 1962 model year, the Ambassador's chassis was in its fifth season on the market. And while Rambler sales had been good enough for third place in industry sales (behind Chevrolet and Ford), AMC's management was working on a revolutionary and somewhat costly design set to debut for the 1963 model year. In the meantime, American Motors needed to save money, and since the Ambassador's sales had fallen in 1961, it was decided that the car would be downsized for 1962 to share its body, windshield and 108-inch (2,743 mm) wheelbase with its Classic line mate. Accordingly, the car was marketed as a Rambler Ambassador. The 1962 Ambassador received a new front end that was very similar to the 1961–62 Classic's, but with a crosshatch design, recessed center section, and Ambassador lettering. New, rectangular taillights were seen at the ends of restyled rear fenders, which lost their fins entirely. Exterior trim was reshuffled, and a new 2-door pillared sedan debuted. A new '400' trim line was added at the top of the line, with Super and Custom models remaining. The Ambassador offered even more luxurious interiors, perhaps to make up for the fact that it now shared its wheelbase with the Rambler Classic. The 400 could be had with vinyl bucket seats, headrests, and color coordinated shag carpets. The only available engine was AMC's 327 cu in (5.4 L) OHV V8, in either the regular fuel, 2-barrel carburetor and 8.7:1 compression ratio, 250 hp (186 kW; 253 PS) version or the premium gasoline, 4-barrel version with 9.7:1 compression ratio, 270 hp (201 kW; 274 PS) version. The 1962 Ambassador came with a dual chamber master brake cylinder that separated the front and rear brakes so that in the event of the failure of one chamber some braking function would remain. This design was offered by only a few cars at that time. The 1962 models were equipped with "Walker" (brand) flow-through mufflers. The 108-inch (2,743 mm) wheelbase 1962 Ambassador was lighter than its 117-inch (2,972 mm) wheelbase predecessors and when equipped with the 270 hp (201 kW; 274 PS) 327 cu in (5.4 L) V8, it was a spirited performer. The 1962, 327 cu in (5.4 L) V8 Ambassador for the first time used the same 108-inch (2,743 mm) wheelbase structure as did the 1957 Rambler Rebel which was also equipped with an earlier solid lifter version of the AMC 327. 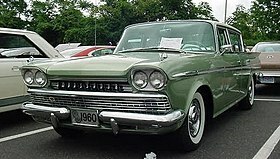 The 1957 Rambler Rebel equipped with a 3-speed column mounted manual transmission, was the quickest 4-door sedan made in the United States, achieving 0 to 60 mph (0 to 97 km/h) acceleration in just over 7 seconds, making it faster than the Hemi Chrysler 300C, the DeSoto Adventurer, the Dodge D500, the Plymouth Fury, and the Chevrolet fuel-injected 283. 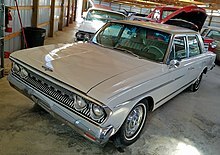 The 1962 Ambassador was available with a 3-speed manual transmission and being basically the same vehicle, should also reach 60 mph about as quickly as did the 1957 Rambler Rebel. In 1962 Romney left AMC to run for Governor of Michigan, a position that he won. The automaker's new president, Roy Abernethy, who was responsible for the increasing sales under Romney, reacted to the mounting competition (in 1963 AMC built as many cars as they had in 1960, but overall total car sales had increased so much that it gave AMC only sixth place in production; the same output in 1960 had put them third) in a logical way: "Let's get rid of this Romney image." A completely redesigned larger Rambler lineup appeared. The new cars continued the philosophy in building smaller cars than its larger "Big Three" competitors that also had a high degree of interchangeability in parts to keep tooling costs and production complexity to a minimum. The company, which pioneered "styling continuity", introduced all-new styling for the 1963 model year Ambassadors and claimed that these were "functional changes .... not change just for the sake of change." The Ambassadors featured a 4-inch (102 mm) longer wheelbase, but were 1.2-inch (30 mm) shorter due to reduced front and rear body overhangs, as well as a 3-inch (76 mm) drop in overall height. Designed by Richard A. Teague, the 1963 Ambassador's shape was much tighter, cleaner, and smoother, with almost all of its parts interchangeable between it and the new Classic. All Ambassadors used unitized structure instead of the more rattl-prone, traditional body-on-frame construction which was still the industry standard. In 1963, AMC's new 112 in (2,845 mm) wheelbase cars (Ambassadors and Classics) used a revolutionary method of unit construction which has since been almost universally adopted by automobile manufacturers. AMC Ambassador and Classics used outerpanels stamped from single sheet metal panels which included both door frames and outer rocker panels. This resulted in an extremely rigid and rattle-free structure, better fit of doors into frames, production cost savings and reduced noise, vibration and harshness. The "uniside" structure was superior to the conventional production methods in which multiple smaller pieces were welded together. There were 30% fewer parts and the result was greater structural rigidity, quieter car operation, and an overall weight reduction of about 150 pounds (68 kilograms). Curved side glass and push-button door handles were new and costly upgrades, but contributed to the new Rambler's handsome, elegant, and modern Mercedes-like bodyside styling, by adding greater elegance in detail. At the time, curved side glass was used only in much more expensive luxury cars, but increased interior room and visibility, as well as reducing wind noise and improved proportions and styling of the cars. The Ambassador also featured a squared-off Thunderbird-type roofline. The front end featured a forward-thrusting upper and lower ends with a vertical bar "electric shaver" chrome grille insert. The Ambassador's grille was differentiated from the Classic's grille by its use of the Ambassador name in script in the small horizontal bar between the upper and lower grille sections. Round quad headlights were slightly recessed in chrome bezels mounted side-by-side within the grille at its outermost edges. Overall, the new Ambassadors were described by the staff of Automotive Fleet magazine as "probably the finest looking cars ever produced by American Motors." Ambassadors once again came in 2-door coupe, 4-door sedan, and 4-door wagon body styles, but new trim lines debuted. A "Mercedes-like three-number model designation was developed" with the 800 as the Ambassador's base line (replacing the previous year's Super model) for the police, taxi, and fleet market, a 880 model (in place of the Custom), and the up level 990 trim (replacing the previous 400 models). The 1963 Ambassadors were offered only with the 327 cu in (5.4 L) V8, in either 250 hp (186 kW; 253 PS) 2-barrel or 270 hp (201 kW; 274 PS) 4-barrel versions. AMC's smaller 287 cu in (4.7 L) V8 engine was only offered in the Classic line. The automatic transmission was controlled by a steering column mounted lever, replacing the previous pushbutton system. Maintenance was reduced with service intervals of the front wheel bearings increased from 12,000–25,000 miles (19,312–40,234 kilometres), the recommended engine oil change was at 4,000 miles (6,437 kilometres), and all Ambassador models included an alternator and an electronic voltage regulator as standard equipment. Sales were brisk, and the redesign was billed a success, with Motor Trend Magazine bestowing Car of the Year status on the entire 1963 Rambler line, including the Ambassador. The marketing formula for the Ambassador generated record sales for the model with buyers favoring more luxury and features as evidenced by the Ambassador 990 models outselling the 880 versions by nearly 2-to-1, while the base 800 model had a total of only 43 two-door sedans built. The automaker did not have the resources of GM, Ford, and Chrysler, nor the sales volume to spread out its new model tooling and advertising costs over large production volumes; however, Richard Teague "turned these economical cars into smooth, streamlined beauties with tons of options and V-8 pep." The 1964 model year introduced minor trim changes and new options. The "electric-shaver" grille on the 1963 model was replaced with a flush-mounted design, and the engine and transmission options were widened. A two-door hardtop body style called 990-H was added for the first time since 1957. Base 880 and the 880 models were dropped from the line. The 1964 Ambassadors featured the 250 hp (186 kW; 253 PS) 2-barrel 327 cu in (5.4 L) V8 as standard, with the 4-barrel 270 hp (201 kW; 274 PS) version as optional. The automaker did not offer a 4-speed manual transmission to compete with the sporty mid-size V8 offerings from Ford or GM. Instead, AMC offered its innovative “Twin-Stick” manual transmission. The "Twin stick" option consisted a three-speed manual transmission, operated by one of the two console mounted "sticks" in conjunction with an overdrive unit that was controlled by the second "stick" in both 2nd and 3rd gears. This gave the driver the option of using five forward gears. One magazine noted the Twin-Stick, 270 hp (201 kW; 274 PS) Ambassador was heading for a sub 16-second quarter-mile when they blew up the clutch. No matter how much success the new Ramblers achieved in the marketplace, Roy Abernethy was not completely satisfied. Using the experience he gained as an outstanding salesman as a guide, Abernethy closely looked at the direction that American Motors' competition was going and decided that the company would be much more successful if its products competed more directly with the Big Three. He would achieve this by pushing all AMC vehicles further upmarket among the various market segments, shaking off the company's economy car image, and offering vehicles once again in all three major American car size classes: compact, intermediate, and full-size. The American and Classic were strong competitors in the former two segments, so for the 1965 model year, he set his sights on turning the Ambassador into a proper full-size car by stretching the Classic's wheelbase and giving it much different styling. The general sizes of automobiles at that time were based on industry standard wheelbase lengths, rather than on the vehicle's interior and cargo space. The 1965 Ambassador represented a fundamental shift in corporate ideology, a shift away from primarily fuel-efficient vehicles, to bigger, faster, and potentially more profitable cars. Although the Ambassador rode the same platform as its 1963–64 forebears, the 1965 models looked all-new. American Motors' designer Richard A. Teague styled the 1965 Ambassador with panache and gave the car an overall integrated look. Motor Trend magazine agreed, calling it a "strikingly handsome automobile." Built on a 116-inch (2,946 mm) wheelbase four inches (100 mm) longer than the Classic, Teague extended the beltline level from the stacked quad headlights to the vertical taillights. The new Ambassadors were as attractive as anything built by AMC's Detroit-based competitors, and with a list price of around $3,000, few could quibble about the cost of ownership. New disc brakes with a power brakes were optional. The Ambassador received longer, squared-off rear fenders with vertical wrap-around taillights, taller decklid, squared off rear bumper mounted low, and squarer rear wheel arches. At the front, the Ambassador again sparked minor controversy with its new vertically stacked quad headlights, which were slightly recessed in their bezels, as they flanked an all-new horizontal bar grille. This new wall-to-wall grille projected forward, horizontally, in the center, to create an effect somewhat opposite to 1963's grille treatment. The front end design provided a bold, rugged appearance. Once again, the Ambassador’s entire extra wheelbase was ahead of the cowl, meaning that interior volume was the same as the intermediate-sized Classic. Another new body style debuted in the Ambassador lineup for 1965: an attractive new convertible offered as part of the 990 series. This was the first time a convertible was offered in the Ambassador line since 1948. All Ambassador body styles (except the 990-H coupe) offered seating for six passengers, with coupes and convertibles having the option of buckets seats with center console and floor shifter. The Ambassador 990-H was an up-scale two-door hardtop model, available only in 5-passenger form. Ambassadors also saw an expanded list of trim lines, convenience options, and engine choices. The 990 and 990-H models were back, while 880 models were the new economy leaders in the 1965 Ambassador line, but even the $2,512 price for the two-door sedan was not attractive compared to the models with better trim, buckets seats, and special interiors. Ambassadors came standard with AMC's new 232 cu in (3.8 L) Inline-6 engine, which was the first time since 1956 that an Ambassador was available with six cylinders. Far more popular in the Ambassador, however, were the two time-tested 287 and 327 cu in (4.7 and 5.4 L) AMC V8 engines. American Motors' management decided that the Ambassador could once again accept a standard six-cylinder engine, since its full-size competitors (e. g. Bel Air and Impala, Ford Custom 500 and Galaxie, as well as Plymouth Fury) came with six-cylinder engines as standard equipment. They therefore appealed to a wider range of customers than the Ambassador was getting. Also, since the Classic was now smaller and styled differently, the Ambassador six-cylinder would not threaten to cannibalize Classic 6 sales, which were the company's sales volume leaders. The changes were on target as sales of the repositioned Ambassador more than tripled. Motor Trend magazine tested an Ambassador convertible with a Twin-Stick overdrive transmission and found it commendably economical, averaging 16.4 mpg‑US (14.3 L/100 km; 19.7 mpg‑imp) over 1,000 miles (1,600 km) run, and noting that ... "Traveling comfort was the Ambassador's biggest selling point, along with its exceptionally powerful Bendix duo-servo drum brakes ...With the thin bucket seats that recline, driver and passengers can enjoy a high degree of riding comfort... Many passers-by commented on the car's good looks... Our summary: a nice, comfortable, quiet, well built family automobile that rather neglects the performance market." For 1966, minor changes greeted the Ambassador range. The V-shaped horizontal louver spanned unbroken between the headlamps and the effect was continued with twin rectangular trim pieces attached to the side of the front fenders at their leading edges by the headlamps. The effect was repeated in the new vertical wraparound taillamps with the top-line models receiving a twin set of horizontal ribbed moldings across the back of the trunk lid that simulated the look of the front grille. Hardtop coupes received a redesigned roofline that was angular in appearance with an angle cut rear side windows and rectangular rear window. The backlight no longer curved and wrapped slightly around the C-pillars. The changes made for a more "formal" notchback look that was popular at the time. Station wagons also received a new roof (that did not have as pronounced dip over the rear cargo area) as well as a redesigned tailgate and optional simulated woodgrain exterior side panels. Available with two-rows of seats with a standard bottom hinged tailgate with electric, fully retracting rear window or with an optional rear-facing third row that featured a left side hinged rear door, with a regular exterior door handle on the right side. All station wagons carried a Cross Country badge. The 880 served as the base model line. The two-door sedan was the price leader at $2,404, but finished with the least sales for the model year. The more popular and better trimmed 990 models were available in sedan, wagon, hardtop, and convertible versions. Options included a vinyl roof, wire wheel covers, AM/FM radio, adjustable steering wheel, and cruise control. A new luxury DPL (short for "Diplomat") two-door hardtop debuted at the top of the range. The DPL included special lower body side trim, numerous standard convenience items such as reclining bucket seats upholstered in brocade fabrics or optional vinyl. An optional interior trim featured houndstooth fabric and included two throw pillows. The DPL model was aimed to compete with the new, more upscale trimmed Plymouth VIP, Ford LTD, Chevrolet Caprice and Oldsmobile Cutlass Supreme. The 232 cu in (3.8 L) I6, as well as the 287 and 327 cu in (4.7 and 5.4 L) V8s remained in the line, but transmission selections now included a new console mounted four-speed manual. Most Ambassadors continued to be ordered with automatic transmissions. Motor Trend magazine tested a 1966 DPL equipped with a 327 engine that "definitely has snap we hadn't felt before" and even with an automatic transmission experienced "healthy wheelspin from both rear wheels [because of the Twin-Grip limited slip differential]... Subtle changes in this year's suspension, which include longer shocks and different springs, have a pronounced effect on the way the car feels and handles. Most welcome is the improved steering response. The car has a new feet-on-the-ground feeling, and body lean seems to have been reduced. The ride remains very good... As before, the interior's the outstanding feature of the Ambassador. Its quality is such that other luxury cars, even higher priced ones, could well imitate it..."
Perhaps the biggest change, however, was that the Ambassador lost its historic Rambler nameplate, as the car was now marketed as the "American Motors Ambassador" or "AMC Ambassador". Abernethy was again responsible for this marketing move, as he attempted to move the stylish new Ambassador even further upmarket. To him, that meant that the Rambler name, and its economy car image would be eschewed to give the car a clean slate in a market that was turning away from economy and toward V8 performance. The evidence suggests that Abernethy was on the right track with moving the Ambassador upscale to compete with other manufacturers' luxury models as sales of the AMC's flagship jumped from 18,647 in 1964 to over 64,000 in 1965, and then in 1966 they went to more than 71,000. Although the Ambassador accounted for a mere fraction of total passenger car sales in the U.S., it was an important step in bringing the AMC's products in line with what the consumer of the day wanted. American Motors introduced a completely restyled longer, lower, and wider Ambassador for the 1967 model year, now riding on a 118-inch (2,997 mm) wheelbase, or two inches (51 mm) longer than before. The Ambassador's platform was four inches (100 mm) longer than the new Rambler Rebel's 114-inch (2,896 mm) wheelbase. 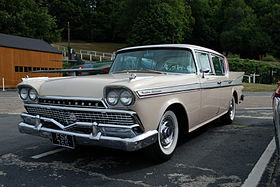 The Ambassador was positioned in the standard-size category, against traditional big cars such as Ford Galaxie, Chevrolet Impala, and Plymouth Fury. The convertible was offered again—this time in DPL trim—for 1967; but it would be the final year with only 1,260 built. It featured an all new "split stack" folding mechanism with concealed side rails that did not intrude into the backseat area, thus offering room for three adult passengers in the rear. The 880 two-door sedans sported the identical roofline as the hardtops, but had slim B-pillars that gave them a more open-air coupe appearance. Adding more elegance to DPL two-door hardtops and convertibles was an optional was a "Satin-Chrome" finish (paint code P-42) for the lower body side replacing the standard full-length stainless steel rocker moldings. A black or white vinyl cover was optional on 990 and DPL sedans and hardtops. The 990 Cross Country station wagons were available with 3M's "dinoc" simulated wood-grain body side panels trimmed in a slim stainless steel frame. The fastback Marlin two-door hardtop that was previously built on the Rambler Classic platform in 1965 and 1966, was continued for 1967, but was now based on the larger Ambassador platform. It featured the Ambassador's front end, longer hood, and luxury appointments with an even longer fastback roofline than the previous version. The Ambassador featured a lengthy list of standard features and options. The interiors "rival more expensive cars for luxury and quality, yet are durable enough to take years of normal wear." The premium materials and fittings included wood-grain trim, and even an optional "Custom" package with special upholstery and two matching pillows. Ambassador DPL hardtops included reclining bucket seats with a center armrest between them (with a center cushion for a third occupant or a floor console with gear selector), as well as a foldaway center armrest for the rear seat. The new safety-oriented instrument panel grouped all gauges and controls in front of the driver, with the rest of the dashboard pushed forward and away from the passengers. Focusing on safety, there were now no protruding knobs, the steering column was designed to collapse under impact, and the steering wheel was smaller than previous Ambassadors. AMC's long-lived "GEN-1" family of V8 engines was finally replaced by an all-new line of 290 and 343 cu in (4.8 and 5.6 L) engines debuted for 1966 in the Rambler American. With a 4-barrel carburetor and dual exhaust, the 343 V8 produced 280 bhp (210 kW) at 4800 rpm and 365 pound force-feet (495 N⋅m) of torque at 3000 rpm. The old torque tube design was eliminated by a new four-link, trailing-arm rear suspension system providing a more comfortable coil spring ride. American Motors promoted the new 1967 Ambassador as an "uncompromising automobile with the red carpet ride" in print advertisements, as well as in an innovative TV commercial. Unfortunately, sales of the redesigned models were disappointing, due to customer confusion caused by the entire company's abrupt upmarket push, which seemed uncomfortably "me too" to the traditional domestic Big Three's customers, and they also alienated American Motors' loyal buyer base. Abernethy's ideas of entering new markets were not working. These strategy changes resulted in a new round of financial problems for American Motors. Because of this, Abernathy was released from AMC by its board of directors later that year, and was replaced by William V. Luneberg and Roy D. Chapin, Jr.
For the 1968 model year, a new SST trim line was placed above the now mid-line DPL trim for the Ambassador. American Motors was a pioneer in the field of air conditioning through its Kelvinator refrigerator division, and AMC's marketing chief Bill McNealy wanted to make the Ambassador stand out in a crowded market segment and decided to add greater distinction to the Ambassador line by making the All Weather A/C system as standard equipment. This was the first time any volume car manufacturer had done so, something that even Cadillac and Lincoln had not offered on their luxury cars – although some of them were priced at more than twice as much as Ambassador. While all Ambassadors came with air conditioning as standard, consumers could order the car without air as a "delete option" and decrease the price by $218. As AMC pointed out in their advertising campaign for the Ambassador, the only other major automaker that offered air conditioning as standard equipment in 1968 was Rolls-Royce. Due to slow sales, both the convertible and the pillared coupe models were dropped from the line, leaving the 990 hardtop coupe and sedan, DPL hardtop coupe, sedan, and wagon, and new SST hardtop coupe and sedan in the Ambassador line. The personal luxury fastback Marlin was also discontinued to make way for the smaller new AMC Javelin in the pony car segment. The top-of-the line 1968 Ambassador SST version was "especially appealing" and "a very luxurious package" with standard V8 power, air conditioning, expensive upholstery, individual reclining front seats, wood-look interior trim, upgraded exterior trim, as well as numerous conveniences such as an electric clock and a headlights-on buzzer. Styling changes were minor. Taillights were now recessed in body-color bezels that were divided by a single central horizontal bar. Front headlight bezels were now made of nylon and similarly body colored. A new injection molded ABS plastic grille was dominated by a horizontal bar that extended forward in the center from the sides, while its outline had squared off edges that wrapped forward into the inner headlight extensions. Fender-mounted marker lights were added at the front and rear as standard equipment, as the U.S. National Highway Traffic Safety Administration (NHTSA) regulations mandated their application (along with seat belts beginning January 1, 1968) to all passenger cars sold in the United States for 1968. However, AMC's most enduring styling feature debuted on the Ambassador for 1968, as flush-mounted paddle-style door handles replaced the former push-button units on all American Motors cars, save the Rambler American. The practical and "disarmingly simple design" predated safety-related mandates and industry norms. The interior locking was no longer by the traditional windowsill pushbutton, but a lever set into the armrest. Front-wheel alignment was made easier with and with greater accuracy by moving the camber adjustment from the upper to the lower control arm on the double wishbone suspension, and the caster angle adjustments also moved from the upper control arm to the drag strut. At midyear, AMC's new top engine, the AMX 390 cu in (6.4 L) 315 hp (235 kW; 319 PS) V8 became an option in the Ambassador line, bringing the total engine options up to four. In June 1967, American Motors started a new advertising campaign created by Mary Wells Lawrence of Wells, Rich, and Greene marketing agency. The US$12 million AMC account was high-profile assignment and helped established the agency as innovative and daring in its approach. The new advertising violated the convention of not attacking the competition, and AMC's campaigns became highly controversial. The publicity worked with AMC's total retail sales improving 13% for the fiscal year, but 1968 Ambassador numbers were slightly down. In 1969, the Ambassador received a major restyling, with a 4-inch (102 mm) gain in overall length and wheelbase. The 122-inch (3,099 mm) wheelbase was accompanied by an increase in front and rear track from 58.5 to 60 inches (1,486 to 1,524 mm). The front end appearance was revised with new quad headlight clusters mounted horizontally in a new molded plastic grille. The grille itself was blackout with a chrome horizontal bar that connected the headlight clusters. The hood was redesigned to accommodate the grille's raised center portion, and it faintly recalled Packard's classic grille/hood combination. Richard A. Teague, AMC's Vice President of Styling, had worked at the luxury car manufacturer before joining AMC. Parking lights were rectangular and mounted horizontally in recessed wells in the front bumper, just beneath each set of headlights. The entire front fascia leaned forward slightly to lend an air of forward motion to the car's appearance. At the rear, ribbed rectangular taillights were mounted inboard the Ambassadors rearward-thrusting rear fenders. Square ribbed marker lights of similar height were mounted at the trailing edge of each fender side. The deck lid had a slightly higher lift over. The base and DPL models had no decorative panel connecting the taillights while the top-line SST versions featured a panel painted red to match the taillights. Station wagons saw vertical wraparound taillights replacing the previous "hooded" units, which were not visible from the side. 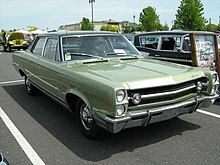 The 1969 AMC Ambassador was a smooth, powerful, well-proportioned sedan that did not look like anything else on the road. The interiors were upgraded and a new deeply hooded dashboard clustered instruments and controls in front of the driver. There was an increased emphasis on luxury-type trim and features. The base model two-door hardtop was dropped for 1969. The 1969 Ambassador stressed luxury, with the marketing tagline developed by Mary Wells Lawrence at the Wells Rich Greene agency, tying the car's value, "It will remind you of the days when money really bought something." The combination of rich velour upholstery, individually adjustable reclining seats, standard air conditioning, and the longer wheelbase were highlighted in advertisements with Ambassador's posh"limousine" ride at an economical price. One aspect of this new advertising theme included many AMC dealers inviting prospective customers to call and request a "demonstration ride", in which a uniformed chauffeur would arrive at the prospect's home and drive them around in an Ambassador SST sedan. AMC's efforts worked, and Ambassador sales shot up again. 1969 Ambassador Royale Stretch Limo by Armbruster/Stageway. Car wears Ambassador SST trim. Not only did AMC promote the 1969 Ambassador as having a "limousine" ride and deluxe appointments, but Chicago auto leasing executive, Robert Estes, had the Armbruster/Stageway Company convert Ambassadors into real 24-foot (7.3 m) limousines riding on a 158-inch (4,013 mm) wheelbase. Known as the Royale Stretch Limo, one was owned by the State of Wisconsin as the official vehicle for Governor Warren Knowles. The conversions were unusual in that they did not keep the stock rear doors—as is typical in most limos. The back doors were welded shut and the Ambassadors were lengthened by inserting a section just behind the original B-pillar that had an entirely new central door in this center making a large opening for entry and egress. Four-inch (100 mm) steel "I-beams" bridge the expanse created by stretch. Power comes from the "AMX" 315 hp (235 kW; 319 PS) 390 cu in (6.4 L) V8 engine backed with the BorgWarner automatic transmission and a "Twin-Grip" limited-slip differential with 3.15 gears. From their experience with supplying the U.S Postal Service with over 3700 right-hand drive Ambassadors in 1968, American Motors thereafter exported fully assembled RHD Ambassadors from the United States to right-hand drive foreign markets, including the United Kingdom, Australia, and New Zealand. 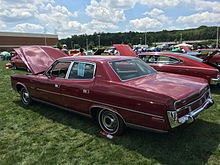 For the 1970 model year, the rear half of Ambassador hardtop coupes and sedans was treated to an overhaul that was also shared by the intermediate 1970 AMC Rebel. On hardtop coupes, this restyling resulted in a sloping roofline that saw upswept reverse-angle quarter windows. The belt line kicked up at the point the hardtop's rear windows swept upward, and tapered back to the fender end, meeting a new loop-type rear bumper. On sedans, the roof line showed a slimmer "C-pillar", squared-off rear door windows, and met a belt line that kicked up beneath the trailing edge of each rear door window. The belt line tapered back to the same rear fascia as the hardtop coupe's. This rear fascia contained a new ribbed taillight lens that stretched wall-to-wall and included twin square white reverse light lenses in its center. Station wagons received no change to their rooflines, doors, and rear fascias. However, all Ambassadors received a new extruded aluminum grille at the front, featuring several widely spaced bright horizontal bars with one wide, body colored horizontal grille bar extending to each headlight cluster. The 290 cu in (4.8 L) V8 was replaced for 1970 by a new 304 cu in (5.0 L) V8 engine. This 210 hp (157 kW; 213 PS) at 4400 rpm and 305 pound force-feet (414 N⋅m) of torque at 2800 rpm was the standard engine on all DPL and SST models. The 343 cu in (5.6 L) V8 was also supplanted by a 360 cu in (5.9 L) engine available in either 2-barrel, regular gasoline, or high-output, 4-barrel, premium fuel versions. The 4-barrel "AMX" 390 cu in (6.4 L) V8 engine was optional, producing 325 hp (242 kW; 330 PS) at 3200 rpm and 420 pound force-feet (569 N⋅m) of torque at 3200 rpm. Following the previous year's redesign, the 1971 Ambassadors received only minor changes and improvements. The marketing tag line for the year was the underdog asking, "If you had to compete with GM, Ford and Chrysler, what would you do? "—that was answered by AMC including more features, advantages, and benefits for buyers of its cars compared to the models from its much larger competitors. This was reflected by shuffling the Ambassador models for 1971 and by including more equipment in the standard feature list. The previously nameless base models were dropped, as the sedan-only DPL trim line was relegated to base model status, and a new top-line Brougham trim line was added above mid-line SST models. Both SST and Brougham models came as hardtop coupes, sedans, and wagons. The DPL came with AMC's new 258 cu in (4.2 L) 150 hp (112 kW; 152 PS) Inline-6 with seven main bearings. All the SSTs and Broughams featured the 304 cu in (5.0 L) V8 engine with 210 hp (157 kW) as standard. BorgWarner's "Shift-Command" automatic transmissions were standard equipment across the line. Two of AMC's 360 cu in (5.9 L) were optional; an 8.5:1 compression version with a two-barrel carburetor or a high-compression four-barrel V8 that required premium-fuel. The previous "AMX 390" V8 gave way to a new 401 cu in (6.6 L) 335 hp (250 kW) V8 as the top engine option. Styling changes consisted of a new fascia up front. It featured headlights contained in their own chrome pods separate from, but flanking the new grille with a bright rectangular surround, with rounded edges. The "natural" cast pot metal grille insert was recessed and featured a bright vertical bar pattern. A second set of parking lights was added outboard of the headlight clusters, and they were integrated into the fender extension to eliminate the need for separate front marker lights. Taillights on hardtop coupes and sedans still ran wall-to-wall, but the twin backup lights were moved from the center to further outboard—approximately eight inches in from either fender side. Once again, the wagon received few changes at the rear, but added a new design for its optional woodgrain side trim, which filled in its upper bodysides. Its lower edge flowed downward aft of its peak at the leading edge above each front wheelhouse, in similar fashion to the Buick Skylark's side "sweepspear" styling cue. Ambassador base models were offered to fleet buyers with various police, taxicab, and other heavy-duty packages. Governments and police departments in the U.S. historically used standard-size, low-price line four-door sedans. Equipped with the 360 or 401 engines, the base Ambassadors saw use as police cruisers and support vehicles. Minor changes greeted 1972 Ambassadors, as AMC's biggest news for the year was the addition of the innovative AMC Buyer Protection Plan, that included the industry's first 12-month or 12,000-mile (19,000 km) bumper-to-bumper warranty. This was the first time an automaker promised to repair anything wrong with the car (except for tires) and owners were provided with a toll-free telephone number to the company, as well as a free loaner car if a warranty repair took overnight. This backing also included mechanical upgrades to increase durability and quality, such as the standardization of electric windshield wipers on all model lines, replacing AMC's vacuum-powered units, as well as better interior trims. By focusing on quality, the smallest domestic automaker was solidly profitable for 1972, earning US$30.2 million (the highest net profit achieved by AMC since 1964) on $4 billion in sales. The base Ambassador DPL model was canceled, with three body styles now available in SST and Brougham trim. Fleet purchasers could order plain Ambassadors in Police Pursuit Vehicle (PPV) or Special Service Package (SSP) versions. A six-cylinder engine was no longer available; thus, Ambassador became a V8-only car for the first time since 1964. This made the Ambassador the only volume-produced American car that included air conditioning, power brakes, automatic transmission, and a V8 engine as standard equipment; all while being priced less than the Big Three's full-sized cars. The base engine was the 304 cu in (5.0 L) with two 360 cu in (5.9 L) or a 401 cu in (6.6 L) versions optional. The engines were designed to operate on regular grade, low-lead, or unleaded gasolines. All were based on the engine designs responsible for AMC winning the 1971–1972 Trans-Am Series. The Borg-Warner transmission was replaced by the "Torque-Command" (TorqueFlite) three-speed automatic sourced from Chrysler. Styling changes on the 1972 Ambassador were limited to a new crosshatch cast metal grille with bright trim and new integrated fender extension mounted side marker lamps on the front. Brougham station wagons included a roof rack, rear air deflector, as well as 3M "dinoc" woodgrain trim on body sides and tailgate. A Popular Mechanics magazine survey after driving a total of 1,000,000 miles (1,609,344 km) found Ambassador owners were pleased with their cars, describing them to be "very comfortable to drive and ride in" with handling listed as a top "specific like" by half of the drivers. A very high percentage (92%) would buy one again. Although the Buyer Protection Plan was listed by only 8.5% as a reason to buy an Ambassador, owners valued the smaller AMC dealers that "had more time to be courteous and to pay personal attention to customers." The SST models were dropped from the line, as all 1973 Ambassadors now came in one high-level "Brougham" trim. Ten popular items including an AM radio, power disk brakes, tinted glass, and whitewall tires were added to the already extensive standard equipment list that included air conditioning, V8 engine, and automatic transmission. The Ambassador line "maintains its reputation as one of the industry's most completely equipped cars." Multiple improvements in quality were designed to reinforce the new "Extended Buyer Protection Plan" exclusive to AMC cars that provided complete maintenance coverage for two years or 24,000 miles (38,624 km). The automaker's marketing campaign shifted to stress quality in a "we back them better because we build them better" advertising with particular emphasis into the Hornet, Matador and Gremlin promotion, while the Ambassador received got individual support with the tagline "you get standard equipment, the luxuries you'd normally have to pay extra for." Model year production for AMC increased 25 percent, outperforming the industry average production increase by 75 percent, with only a slightly changed product in the showrooms. In range rationalization to a single trim available in two-door hardtop, four-door sedan, and station wagon body versions, the styling changes for the 1973 Ambassadors were minimal. Heftier front and rear bumpers were included to comply with new U.S. National Highway Traffic Safety Administration (NHTSA) regulations that required all passenger cars to withstand a 5-mile-per-hour (8 km/h) front and a 2.5-mile-per-hour (4 km/h) rear impacts without damage to the engine, lights, and safety equipment. Ambassadors complied with the regulation by incorporating a stronger front bumper equipped with self-restoring telescoping shock-absorbers. Designed to "give" as much as 3.5 in (89 mm), it jutted slightly forward from the front fascia and incorporated flexible trim matching the body paint. This bumper also featured a more prominent horizontal rubber guard at its upper portion near the grille, thus eliminating the need for a pair of vertical chrome bumper guards that was optional before. The rear bumper gained vertical black rubber bumper guards that also replaced a pair of similar and previously optional chrome bumper guards. The grille gained heavier horizontal bars and headlight bezels took on blackout trim in their recessed portions. The 1974 Ambassador Brougham was no longer available as a 2-door (pillar-less) hardtop, leaving the 4-door sedan and station wagon body styles in the line. The hardtop's cancellation was due in part to low sales volume of the Ambassador 2-door versions, as well as the introduction of an all-new 1974 Matador coupe that featured a very long hood and a short rear deck. The new coupe was selected as the "Best Styled Car of 1974" by the editors of Car and Driver magazine and did not have the requisite share the typical mid- to late-1970s styling hallmarks that included an upright grille, a notchback roof, and imitation "landau bars" or opera lights. Styling changes for the sedan and wagon included new front fender caps on the same fenders as used since 1969, and hood, grille, bumpers, rear fascia, instrument panel, interior trim, hood ornament, and a new font for the Ambassador nameplate. The grille showed off a new squared-off loop-type design surrounding the circular recessed quad headlights, and featured a forward-protruding center. The insert held a crosshatch pattern dominated by two thick horizontal bars that connected the headlight bezels and contained new parking lights between them. These parking lights had amber lenses, followed the grille protrusion forward, and were overlaid by the grille's crosshatch trim. Headlamp bezels were once again blacked out in their recessed areas. The new hood and front bumper followed the grille's central protrusion forward, giving the car a slight "coffin nose" look. The revised Matador sedan saw a similar frontal treatment in 1974, but with a much more pronounced effect and with different single headlamp clusters, hood, and grille insert. As with the new Matador sedan, the new rear bumper was much larger and backed by shock absorbers, as it was beefed up to comply with new National Highway Traffic Safety Administration regulations for standardized front and rear bumpers on passenger cars that could sustain a 5-mile-per-hour (8 km/h) impact with no damage. Fiberglass end caps were added to the ends of each rear fender on sedans. They wrapped inward to create a recessed space that met a carryover decklid. In this space was mounted the new rectangular taillight housings, which featured taller white backup lights mounted inboard of the new taillights. The license plate moved from the rear bumper to the area between the new taillight assemblies, and the whole taillight and license plate system on the sedans was surrounded its own loop of chrome trim. Both Ambassador and Matador sedans shared the same rear end style. Industrias Kaiser Argentina (IKA) produced the U.S. third, fourth, and fifth generation Ambassadors in Córdoba, Argentina from 1962 to 1972, and later available by special order through 1975. Assembly of IKA Ramblers began in 1962, with the Argentinean cars being the 1961 U.S. versions, but equipped with 226 cu in (3.70 L) Continental I6 engines producing 119 hp (89 kW; 121 PS) at 4000 rpm, along with a steering column mounted manual three-speed transmission. The Ambassador 440 was the top trim IKA model available only as a four-door sedan. The completely new generation models by AMC in the U.S. for the 1963 model year was also replicated by IKA. The Ambassador sedan came only in 990 trim and it revolutionized the Argentine automotive market by introducing innovations that included power steering, power windows, and factory installed air conditioning. The Ambassador line was redesigned for 1965 in the U.S., as well as for Argentina. All IKA Rambler models now featured the 230.5 cu in (3.78 L) overhead camshaft (OHC) straight-six "Tornado Interceptor" engines producing 145 hp (108 kW; 147 PS) at 4200 rpm. They were originally developed by Kaiser Motors in the U.S. for the 1963 Jeep Gladiator pickups and Wagoneer vehicles. The engine was now produced in Argentina and it increased the domestic (local sourced) content of IKA automobiles to lower taxes (tariffs). The new IKA Ambassador 990 sedans were further upgraded to steering column mounted ZF four-speed manual transmissions, front disk brakes, front reclining bucket seats with center cushion and armrest, as well as the luxury features that included power windows and air conditioning. A road test by Revista Parabrisas described the 1965 IKA Rambler Ambassador 990 as "soft, opulent, and smooth ride at all speeds... something big, luxurious and complete... the highest expression of comfort tested so far by the magazine." Stretch versions of the IKA Rambler Ambassador were used as official government limousines. The "Presidential" models featured a longer rear door and side window, as well as broader C-pillar with padded vinyl roof cover and a small rear window. Australian Motor Industries (AMI) obtained the rights to assemble and distribute Ramblers, and the 1961, 1962, and 1963 model year Ambassadors were built in Australia. The 1961 sedan, which was powered by a 327 cu in (5.4 L) V8, was the most powerful car being assembled in Australia at that time. Knock-down kits featuring right-hand drive were shipped from Kenosha to AMI's facilities in Port Melbourne, Victoria. The Australian-built Ambassadors included a significant percentage of "local content" to gain import tariff (tax) concessions by using parts and components (such as interiors and upholstery) that were sourced from Australian manufacturers. AMI's first year of production resulted in 65 registrations for 1961. Registrations of the 1963 model continued into 1964 for a total of 21 Ambassadors registered for 1964. Although not documented in any AMI records, according to Australian Rambler oficionados 20 right-hand drive 1970 Ambassadors were fully imported from Kenosha, apparently 16 two-door hardtops and 4 four-door sedans. One possible reason for this was that it may have been a holding action while AMI was preparing for assembly of the new 1970 Rebel. AMC had assembled over 3700 RHD Rambler Ambassadors for the U.S Postal Service in 1967, so they were well experienced in making completed right-hand drive vehicles. The dash and instrument pack of the 1967 Ambassador which had been converted and used in the RHD Ambassadors assembled for the U.S Postal Service was thereafter used in all Australian and New Zealand-assembled Rambler Rebel and Matador models, and all RHD, U.S-built Rebel and Matadors for the United Kingdom. American Motors motor vehicles were assembled in New Zealand by Motor Holdings at their Volkswagen plant in Otahuhu, Auckland from 1954 until 1962. From 1964, AMC vehicles were assembled by Campbell Motor Industries (CMI) in Thames, New Zealand. CMI assembled the Rambler Classic, American and Rebel models from knock-down kits and, like Australia, were marketed under the Rambler marque even after the marque was dropped in the US after 1967. CMI also imported fully assembled RHD vehicles from Kenosha. Although no Ambassadors were locally assembled by CMI, it is believed 12 1970 RHD Ambassador coupes were fully imported. Rambler vehicles were marketed in Costa Rica since 1959. New local content regulations enacted during the 1960s effectively required vehicles sold in those markets to be assembled from knock-down kits. An assembly plant for Rambler and Toyota vehicles was established, ECASA, and the first Ramblers were produced in Costa Rica by the end of 1965. The company built Ambassadors and other AMC models through 1970, with Toyota increasing ownership of ECASA. American Motors first-generation Ambassadors were exported to Mexico in the first half of 1958 and assembled locally in the second half of the same year and 1959 under Planta REO based in Monterrey, Nuevo León. The model was virtually restricted to the four-door hardtop sedan only. It was powered by the four-barrel 327 cubic inch V8 engine with 270 gross horse power coupled to a three-speed automatic transmission. The model became the marque's top-of-the-line product alongside the three versions of the midsize Rambler and Rambler American models. However, low sales figures alongside a downfalling relationship between AMC and Planta REO lead to the cancellation of the contract in the second half of 1959. American Motors once again exported its products into Mexico and took the task of finding a new local partner, which was found in Willys Mexicana, the company that eventually would become Vehículos Automotores Mexicanos (VAM). The agreement was signed in March 1960 and production began in Mexico City. This agreement meant the discontinuation of the Ambassador line in Mexico, the new operation had several priorities above offering a top-end luxury full-size car line. Aside from offering the already existing Jeep line, Willys Mexicana opted to focus all efforts in the compact Rambler American, which obtained a generation change just the next year, meaning a complete retooling of the Vallejo plant. In 1962, legal and industrial requirements in the country became stronger with the auto industry integration decree issued by president López Meteos in 1962. Among its contents, it fully banned the importation of automobile engines; forcing WM to take the monumental task of building its own engine plant, which was achieved in November 1964. Once the Rambler American was consolidated in the Mexican market, Willys Mexicana opted to expand the product line by introducing the brand-new second generation Rambler Classic midsize model as a larger luxury counterpart to the economy compact American. Also in 1963, due to problems with WM's parent company (the SOMEX bank) as well as further requirements of the government auto industry decree, Willys Mexicana was reorganized into an entirely new company with expanded capital and direct investment from the Mexican government, Kaiser Willys and American Motors, resulting in the formation of Vehículos Automotores Mexicanos S.A.
After the whole corporate transition process between 1960 and 1964 finally concluded, in which the Rambler marque under VAM monumentally surpassed the commercial results of its local predecessors Armadora Mexicana and Planta REO combined between 1950 and 1959, the company in the end opted not to offer the Ambassador model. The Mexican market of the era was still relatively small and since the Ambassador shared mostly the same styling as the contemporary midsize model of the company, it was considered that internal competition would affect the sales of a simultaneous Rambler Classic/Ambassador line-up. Unlike the United States, which had a much larger and diverse market for two different car lines with the same styling, AMC could offer a strong difference between both models with the exclusive V8 engine for the Ambassador and the Classic being restricted to six cylinders only. This advantage did not exist in Mexico since VAM could only produce six cylinder engines in its Lerma plant and V8 engines could not be imported from AMC due to the ban of the 1962 decree. Instead, VAM opted to use the Rambler Classic as its most luxurious and flagship model, giving it the same treatment AMC put in the Ambassador model in the US and Canada. This would be passed on to the subsequent equivalent Rebel and Matador models produced under VAM. The 1958–1959 Ambassador models represent the only chapter in this model's history to be present in Mexico. These were the only full-size American Motors products sold in the country alongside the second generation VAM Classic (Matador) models. Even more unique was the fact that it was a factory V8 model, the only one of its kind to ever be sold in Mexico belonging to American Motors. Because AMC was focusing its attentions on their newly acquired Jeep line, the redesigned 1974 Matador coupe, and the AMC Pacer, which would debut in 1975, the company would not put forth the investment to continue the full-size Ambassador line after its 1974 redesign. 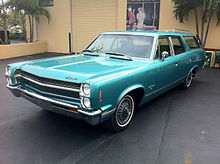 Instead, the automaker upgraded the Matador sedan and wagon counterparts starting with the 1975 model year. The basic automobile platform was used by AMC since the 1967 model year, and the full-size automobile market segment was declining. American Motors strategy now aimed at smaller cars and sport-utility vehicles. However, the Ambassador basically continued as the similarly sized and styled Matador sedans and wagons became available in uplevel "Brougham" trim from 1975, as well as in a unique top-of-the-line Barcelona trim in its final year of production, 1978. ^ a b "1970 American Motors Ambassador sales brochure". lov2xlr8.no. p. 2. Retrieved 15 September 2014. ^ a b c Neasmith, Bruce (July–August 2006). "AMC Rambler in Australia Part 1". Restored Cars (177): 39, 40, & 69. ^ a b c "AMC American Motors Corporation, Costa Rica". amc.co.cr. Retrieved 15 September 2014. ^ "1959 Rambler Wagons brochure". oldcarbrochures.org. Archived from the original on May 22, 2014. Retrieved 23 August 2014. ^ "Ambassador V-8 has changed appearance". Popular Mechanics. 114 (5): 90. November 1960. Retrieved 23 August 2014. ^ Auto Editors of Consumer Guide (22 August 2007). "1957-1960 Rambler Rebel". howstuffworks.com. Retrieved 23 August 2014. ^ a b Auto Editors of Consumer Guide (21 November 2007). "1963-1964 AMC/Rambler Ambassador & Classic, page 1". HowStuffWorks.com. Retrieved 15 September 2014. ^ a b c d e "Styling Conformity Marks the 1963s; Last Year's Functional Changes Expanded". Automotive Fleet. October 1962. Retrieved 15 September 2014. ^ a b c Auto Editors of Consumer Guide (21 November 2007). "1963-1964 AMC/Rambler Ambassador & Classic, page 2". HowStuffWorks.com. Retrieved 15 September 2014. ^ a b Truesdell, Richard (14 February 2014). "Driving George Romney's 1964 Rambler Classic 550 Two-Door Sedan - Michigan Governor George Romney Stayed Humble in his 1964 Rambler". Motor Trend. Retrieved 15 September 2014. ^ Isbrandt, Ralph H. (February 1963). "Rambler Engineering". Motor Trend. AMCRC. Retrieved 23 August 2014. ^ Auto Editors of Consumer Guide (21 November 2007). "1963-1964 AMC/Rambler Ambassador & Classic Specifications". HowStuffWorks.com. Retrieved 15 September 2014. ^ a b c Gunn, Malcolm (23 July 2008). "Fine Lines: 1965–1966 AMC Ambassador". auto123. Retrieved 23 August 2014. ^ a b c Vance, Bill (17 March 2006). "Motoring Memories: AMC Ambassador, 1965–1966". Autos Canada. Retrieved 23 August 2014. ^ Auto Editors of Consumer Guide (23 October 2007). "Design of the 1965–1966 Rambler Ambassador". howstuffworks.com. Retrieved 23 August 2014. ^ "1965 Rambler Ambassador brochure". Oldcarbrochures.com. Retrieved 23 August 2014. ^ Auto Editors of Consumer Guide (23 October 2007). "1965–1966 Rambler Ambassador: Creating the early Rambler Ambassador". howstuffworks.com. Retrieved 23 August 2014. ^ Auto Editors of Consumer Guide (23 October 2007). "1965–1966 Rambler Ambassador: The 1965–1966 Rambler Ambassador's amenities". howstuffworks.com. Retrieved 23 August 2014. ^ a b c Auto Editors of Consumer Guide (23 October 2007). "1965–1966 Rambler Ambassador". howstuffworks.com. Retrieved 23 August 2014. ^ a b Auto Editors of Consumer Guide (23 October 2007). "1965–1966 Rambler Ambassador Performance Statistics". howstuffworks.com. Retrieved 23 August 2014. ^ Norbye, Jan P. (October 1965). "The 1966 cars". Popular Science. 187 (4): 79. Retrieved 23 August 2014. ^ Auto Editors of Consumer Guide (11 October 2007). "1967–1968 AMC Ambassador". auto.howstuffworks.com. Retrieved 23 August 2014. ^ "1967 AMC Data Book". oldcarbrochures.org. p. 48. Archived from the original on April 27, 2014. Retrieved August 23, 2014. ^ a b "Full-Size American Motors". Motor Trend: 90. November 1966. ^ "1967 AMC Data Book". oldcarbrochures.org. p. 73. Archived from the original on August 26, 2014. Retrieved August 23, 2014. ^ Auto Editors of Consumer Guide (11 October 2007). "1967 AMC Ambassador Styling". howstuffworks.com. Retrieved 23 August 2014. ^ Auto Editors of Consumer Guide (11 October 2007). "1967 AMC Ambassador Engineering". howstuffworks.com. Retrieved 23 August 2014. ^ American Motors (February 10, 1967). "Ambassador, The Red Carpet Ride". Life: 57. Retrieved 23 August 2014. ^ Ross, Wallace A. (1967). Best TV Commercials of the Year, Volume 2. Hastings House. p. 13. ^ Auto Editors of Consumer Guide (11 October 2007). "1967–1968 AMC Ambassador". howstuffworks.com. Retrieved 23 August 2014. ^ Foster, Patrick R. (2013). American Motors Corporation: the rise and fall of America's last independent automaker. Motorbooks. p. 99. Retrieved 3 November 2014. ^ "The 1968 cars". Changing Times - Kiplinger's Personal Finance. 21 (12): 25. December 1967. Retrieved 3 November 2014. ^ Auto Editors of Consumer Guide (11 October 2007). "1968 AMC Ambassador". howstuffworks.com. Retrieved 23 August 2014. ^ a b c "What's new at American Motors". Popular Science. 191 (4): 118. October 1967. Retrieved 23 August 2014. ^ a b Donnelly, Jim (July 2010). "Paddling for Life Itself - a timeless American Motors part that outlasted its maker". Hemmings Motor News. Retrieved 23 August 2014. ^ "Irreverence at American". Time. 22 November 1967. Retrieved 23 August 2014. ^ Belliveau, Nancy (27 October 1967). "Sledge-hammer Sell". Life: 104–106. Retrieved 23 August 2014. ^ Auto Editors of Consumer Guide (11 October 2007). "1967–1968 AMC Ambassador Specifications". howstuffworks.com. Retrieved 23 August 2014. ^ "Rambler Rebel & Ambassador 1970 UK Market Sales Brochure". ebay.com. Archived from the original on September 6, 2014. Retrieved 15 September 2014. ^ "Family cars: the '69 cars". Popular Mechanics. 130 (4): 99 & 101. October 1968. Retrieved 15 September 2014. ^ Auto Editors of Consumer Guide (26 November 2007). "1967, 1968, 1969 AMC Ambassador Specifications – page 2". howstuffworks.com. Retrieved 23 August 2014. ^ Foster, Patrick R. (2013). American Motors Corporation: The Rise and Fall of America's Last Independent. Motorbooks. p. 102. ISBN 9780760344255. Retrieved 15 September 2014. ^ Theobald, Mark (2004). "Armbruster & Co.; Armbruster / Stageway". Coachbuilt.com. Retrieved 23 August 2014. ^ Strohl, Daniel (October 2008). "1969 AMC Ambassador Limousine". Hemmings Classic Car. Retrieved 23 August 2014. ^ Missouri State Highway Patrol (2006). "History of the Motor Equipment Division" (PDF). Archived from the original (PDF) on May 27, 2010. Retrieved 23 August 2014. ^ "1971 Greenfield Police patrol Ambassador". Archived from the original on July 4, 2004. Retrieved 23 August 2014. ^ a b "1972 AMC Ambassador press photos". The Old Car Manual Project. 1 September 1971. Retrieved 28 July 2015. ^ "1972 AMC Full Line brochure". The Old Car Manual Project. p. 25. Retrieved 28 July 2015. ^ Sessler, Peter C. (2010). Ultimate American V-8 Engine Data Book (Second ed.). MBI Publishing. p. 227. ISBN 978-0-7603-3681-6. Retrieved 28 July 2015. ^ a b c Lamm, Michael (May 1972). "American Motors' Guaranteed Car". Popular Mechanics. 137 (5): 94–194. Retrieved 28 July 2015. ^ "13 Models Offered by AMC for 1973". Michigan Manufacturer and Financial Record: 80. 1972. Retrieved 6 July 2017. ^ "American Motors Introduces the Extended Buyer Protection Plan". Popular Science. 202 (3): 82–83. March 1973. Retrieved 6 July 2017. ^ "AMC Marketing to stress Quality, Identity, Image". Automotive News. Crain Automotive Group: 18. 2 August 1972. Retrieved 6 July 2017. ^ "1973 Ambassador is the only full-size car that comes standard with (advertisement)". Time. 101: 76. 1973. Retrieved 6 July 2017. ^ Flory, J. Kelly (2012). American Cars, 1973-1980: Every Model, Year by Year. McFarland. pp. 24–30. ISBN 9780786456369. Retrieved 6 July 2017. ^ Lamm, Michael (October 1972). "AMC: Hornet hatchback leads the lineup". Popular Mechanics. 138 (4): 118–202. Retrieved 6 July 2017. ^ Norbye, Jan P. (October 1973). "New bumpers have uniform height, take angle impacts". Popular Science. 203 (4): 90–91. Retrieved 23 August 2014. ^ Schultz, Mort (March 1974). "Cars to take your rig in tow". Popular Mechanics. 141 (3): 156–157. Retrieved 23 August 2014. ^ "IKA - Características Classic Custom - Classic Custom De Luxe - Ambassador 440" (in Spanish). Coche Argentino. 18 May 2009. Retrieved 23 August 2014. ^ "Old Cars of Argentina Manufactured by Industrias Kaiser Argentina S.A. (IKA)". oldcarandtruckpictures.com. Retrieved 13 January 2016. ^ "IKA Rambler Ambassador 990 - 1965 - La más alta expresión del confort". Revista Parabrisas (in Spanish). testdelayer.com.ar. October 1965. Retrieved 13 January 2016. ^ "Perón asume la presidencia 12 de octubre de 1973". youtube. Retrieved 23 August 2014. ^ a b Ruhi, Joaquín (10 May 2014). "The Ultimate Toyota Restoration: The Backstory". Kaizen Factor. Retrieved 15 September 2014. ^ "Timeline of American Motors in Costa Rica". amc.co.cr. Retrieved 15 September 2014. ^ "Activities by RegionLatin America". Toyota Motor. Retrieved 18 August 2014. Foster, Patrick R. (2004). AMC Cars: 1954–1987 An Illustrated History. Motorbooks. ISBN 978-1-58388-112-5. Foster, Patrick R. (2004). AMC Performance Cars: 1951–1983 Photo Archive. Motorbooks. ISBN 978-1-58388-127-9. Foster, Patrick R. (1993). American Motors – The Last Independent. Krause Publications. ISBN 978-0-87341-240-7. Foster, Patrick R. (December 1992). "1958–1962 Ambassador: A Rambler By Any Other Name". Collectible Automobile. 9 (6). Mitchell, Larry G. (1994). Illustrated AMC Buyer's Guide. Motorbooks. ISBN 978-0-87938-891-1. Wikimedia Commons has media related to AMC Ambassador.